This morning’s Job Openings and Labor Turnover Survey (JOLTS) report came in pretty much in line with other economic indicators that suggested a solid finish the 2015 labor market. Most notably, the hires and quits rates saw small upticks in December, a positive sign for an economy continuing to recovery. Unfortunately, those stronger results were somewhat tempered by January’s employment numbers, so the big question will be whether the upticks in today’s report will hold or will return back to their lower values. If these trends continue, it will mean we are still on the road towards full employment. Regardless, we need to stay on that road by encouraging the Federal Reserve to keep their foot off the brakes and encouraging policymakers at all levels of government to abandon austerity in favor of boosting local and state economies through increased investments and public sector employment. While jobs day brings a whole series of great measures to analyze labor market slack, from the prime-age employment-to-population ratio to nominal wage growth, my favorite indicator on JOLTS day is the quits rate. 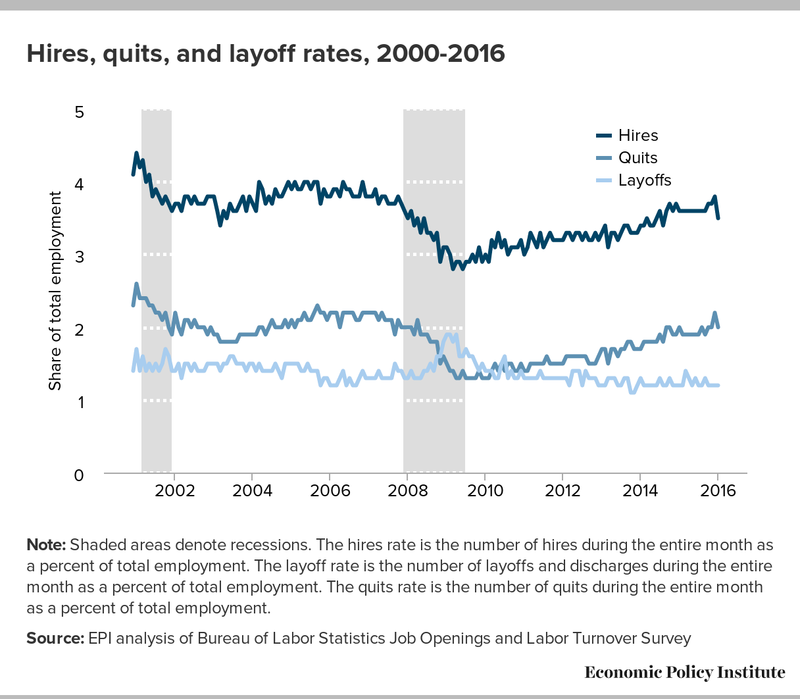 A high quits rate is important because it means that workers feel confident enough in the economy to quit jobs that are not right for them and search for ones that are. It means a stronger labor market, where job opportunities abound and workers can find a better match. We often talk about all those workers who have been discouraged by economy, who aren’t seeing opportunities for them in the labor market or getting the hours they want. The quits rate is a similar measure. In a stronger economy, we should see the underemployment rate tick down while the quits rate ticks up. As you can see in the figure below, the quits rate has recently been moving up, but it’s still below a fully recovered rate and certainly below a full employment rate. In the figure below, we’ve mapped the number of unemployment workers against the number of job openings in each sector. As the labor market gets tighter, we should see some sectors leading the way. Some sectors are doing better in absorbing slack—professional and business services, health care and social assistance, and finance and insurance are showing relatively better prospects. Construction, meanwhile, is consistently a sector where the unemployed outnumber job openings by a large degree. 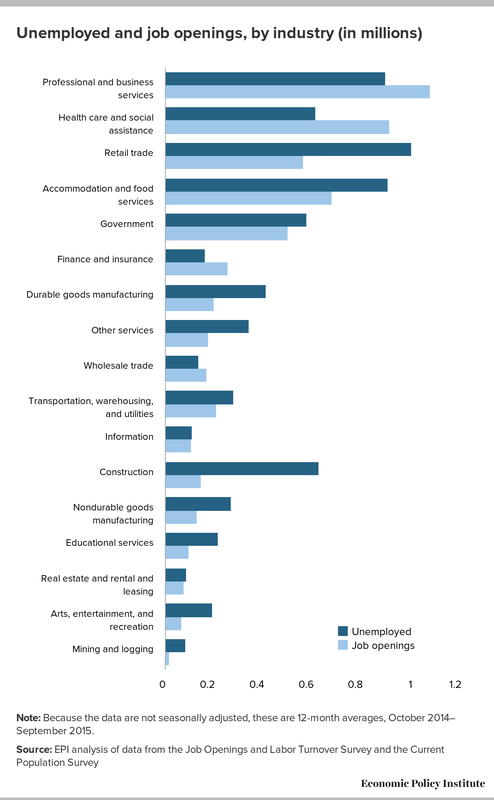 There are about 4.3 unemployed construction workers for each job opening in construction. As the labor market continues to improve we should see wage growth accelerate, perhaps starting with the sectors that appear tighter. Indeed, all of these indicators will tighten as the economy moves towards full employment, as long as policymakers let it get there.